I installed the Emgu CV , set the environment variable paths, created the Scene in Unity3d and added the face detection script in it. And I Add the required DLL files in Unity Asset Folder. 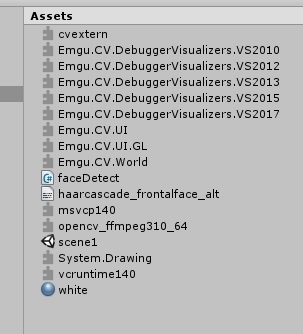 Note that I set the Experimental .NET 4.6 version in Unity because the Emgu.CV.DebuggerVisualizers DLL files are only supported on .NET 4.x versions. Please help me. How can I solve the error of TypeLoadException, to successfully integrate the Emgu CV into Unity3d.